A piece of a dock from Japan that washed all the way to Newport, Oregon following the 2011 tsunami. The Pacific Northwest is now working to prepare for a similarly huge earthquake that could send waves ricocheting across the Pacific in the other direction. In the year 1700, an earthquake rocked the Pacific Northwest, sending tsunami waves not just toward the local coastline but all the way across the ocean to Japan. Inspiring legends at the time, scientists now know that the quake was triggered by a catastrophic jolt on the Cascadia Subduction Zone, where the Juan de Fuca tectonic plate meets and descends beneath the North American plate. There hasn’t been a so-called megathrust earthquake in the region since, but as stress on the boundary continues to build, another in the future is inevitable. Geoscientists have long called for an early warning system to prepare for such an eventuality, which could easily become among the worst disasters in U.S. history, killing tens of thousands and displacing many more, while inflicting tens of billions of dollars of damage. Now, Congress is finally starting to listen. A new bill—HR 876, the Pacific Northwest Earthquake Preparedness Act of 2019—is the latest sign that the idea of an early warning system for the Pacific Northwest’s version of the “Big One” is gaining traction. Sponsored by Democratic congressman Peter DeFazio, representing the 4th Congressional District in Oregon, HR 876 passed the House on February 6 with a voice vote, and is now looking for a companion bill in the Senate. The bill’s main objective is to get the Federal Emergency Management Agency (FEMA) to investigate the best way to purchase and set up an early warning system for the Pacific Northwest. This would require the President to establish an Earthquake and Tsunami Task Force for the region. Led by FEMA, such a task force would bring together multiple agencies, institutions and stakeholders to develop a strategy to plan for, mitigate, respond to and recover from a major quake and tsunami at the Cascadia Subduction Zone. Before diving into the specifics, it’s important to note that the West Coast recently started to roll out a prototype early warning system: ShakeAlert. Spearheaded by the United States Geological Survey (USGS) and built on top of three regional seismic networks—in Southern California, Northern California and the Pacific Northwest—it aims to alert those on the West Coast of major earthquakes several seconds before the shaking starts. ShakeAlert is currently in an experimental stage, with plenty of tests still ongoing. As of 2019, those in Los Angeles will now get public alerts via an app whenever a magnitude 5.0 or greater quake occurs. Paul Bodin, the network manager of the Pacific Northwest Seismic Network (PNSN), explained that this system is nowhere near completion. California, particularly the south, has built out this system far more than the Pacific Northwest, the latter of which he estimates is just 40 to 50 percent complete. “The system isn’t as sensitive nor is it as robust as we need it to be for it to be fully operational right now,” he said. Importantly, ShakeAlert is currently an onshore warning system. While onshore seismic listening posts can keep an eye on the Cascadia Subduction Zone to some extent and there are also a handful of listening posts offshore, the West Coast doesn’t really have a dedicated offshore early warning system. That’s a problem, because offshore is exactly where those highly devastating, tsunami-generating megathrust quakes can happen. 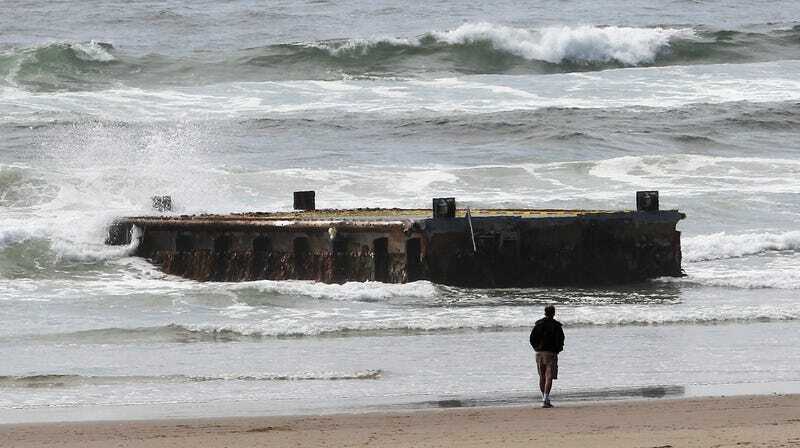 “There’s activity out there that we’re not capable of seeing with onshore sensors,” Douglas Toomey, a professor of geophysics at the University of Oregon – which is part of the Oregon chapter of the PNSN – told Earther. DeFazio’s bill aims to fill this gap by looking into a system that provides warnings specifically for those offshore quakes, said Bodin. It’s early days: HR 876 is an authorization law, not an appropriations bill. If it’s signed into law, FEMA’s Task Force will work with agencies like the USGS, the National Academies and various other state groups and local communities to see what needs to be done to set up an offshore warning system, as well as how to integrate it with the current onshore system. No money will be ordered to be spent at this stage. Plenty of inspiration for the Task Force would likely come from the Pacific Northwest’s mirror image, both in a tectonic and societal sense: Japan. DeFazio told Earther that he was impressed by their onshore warning system during a recent visit to the country. A particular highlight: when a major quake occurs, the shinkansen—the high-speed railway colloquially known as the ‘bullet train’—along with other major public utilities shut down with just a minute’s warning. DeFazio reckoned a similar feature could be adopted to major Pacific Northwest cities like Portland, which would help to save lives and infrastructure that today would be unavoidably lost. At present, “we are so underprepared compared to the Japanese,” he said. Tobin agrees that Japan’s system is the world’s best. Already smothered in onshore seismic listening stations wired up to the country’s scientific and government agencies, the country was in the midst of developing its offshore component when the cataclysmic 2011 Tōhoku earthquake and tsunami struck. After that, he said, Japan devoted close to $1 billion to new offshore instrumentation. A huge network of cutting-edge sensors providing real-time data rapidly began to cover the nation’s major subduction zones. Adequate funding will be key. Offshore seismic networks are more expensive than their onshore equivalents “by an order of magnitude,” said Tobin, and a West Coast version will cost in the hundreds of millions of dollars if Japan’s offshore network is anything to go by. It’s not just a matter of using Japan’s blueprint. Cascadia is a different tectonic beast and as such will require a bespoke system. But while there are plenty of technological options to choose from, the specifics are a matter for the future. What matters now is that if the bill passes, “it will trigger this conversation to happen, and put a spotlight on all this,” said Tobin. The bill, however, still has a long road ahead. The Senate still needs to produce a companion bill, which isn’t guaranteed. A 2017 bill not too dissimilar to HR 876 failed to make it into law not too long ago, although some of its language—specifically, that permitting pre-disaster mitigation funds to be put into an early warning system—made it into the Disaster Recovery Reform Act of 2018. “We should take a moment to really praise the fact that on so many levels, from the federal to local level, that this issue is getting so much attention,” he said. Indeed, the development of ShakeAlert was driven by widespread bipartisan support. And concern about seismic hazards in the Pacific Northwest, specifically, seems to be on the rise. Tobin and Bodin both cited Kathryn Schulz’s 2015 New Yorker article on the Cascadia threat as causing a real boost in the general public’s cognizance of the hazard. That’s a good start, but Maximilian Dixon, the hazards and outreach program supervisor at Washington State’s Emergency Management Division, said that if a task force focused on the Cascadia Subduction Zone becomes reality, it’ll still need to do substantial outreach.